Remanent magnetism preserved in volcanic and some sedimentary rocks through the ages gives us a series of fossil ‘compass needles’ set in stone when grains of magnetised minerals crystallised or were deposited. Their alignment shows both direction and inclination of the Earth’s magnetic field at the time when the ‘compass’ was set. Assuming that the magnetic poles have always been more or less near the axis of rotation, rocks in a piece of crust that has never moved should only contain magnetic polarisation that lines up with present-day N-S and is inclined at an angle corresponding to the crustal block’s present latitude, no matter how old they are. No such coincidences have emerged from the hundreds of thousands of palaeomagnetic measurements that geophysicists have made (examine any road cutting that exposes solid rock and you may well find holes drilled to remove samples for palaeomagnetic measurements, for all the world looking like attacks by giant insects with diamond mandibles). Instead, plotting out the time series of magnetic direction and inclination for a particular crustal block gives a meandering track, that loops back bowel-like on itself (Figure 6.1). Assuming that the magnetic pole has not wandered erratically over time, these apparent polar wander paths reflect how the crustal block has drifted. Figure 6.1 Apparent polar wander path from 2000 to 800 Ma for Precambrian rocks in North America, fitted by one geophysicist to actual data , superimposed on how continental crust may have been assembled in the Precambrian before 800 Ma. Juggling apparent polar wander paths for magnetically distinct crustal blocks is the key to seeing their relative movements through time (Figure 5.4). For the last 200 Ma the ocean-floor magnetic stripes independently check reconstructed continental positions in the near past. By progressively removing older and older strips of oceanic crust Wegener’s jigsaw pieces are shuffled back to fit as they were before the current round of continental drift. The two methods give much the same picture as Wegener deduced – the unification of all modern continents in the supercontinent Pangaea before 200 Ma ago (Figure 6.2a). Remanent magnetic field directions from all continents replotted relative to this assembly fall together on a single broad path that tracks back in time for almost 150 Ma to the earliest Carboniferous Period. Pangaea slowly drifted as a stable mass during that time. Part of Wegener’s evidence for his reconstruction, the lining up of even older belts of intense crustal deformation and igneous activity, provides a means for handling and deciphering magnetic-pole information from yet earlier times. These belts are sites where yet older masses of crust jostled, eventually to weld together the modern fabric of continents (Figure 6.2a). Such keys to geographic fitting, like the roof lines and drainpipes of the archetypal cottage of popular jigsaws, divide Pangaea into blocks for the purpose of magnetic reconstruction of earlier continental wanderings. 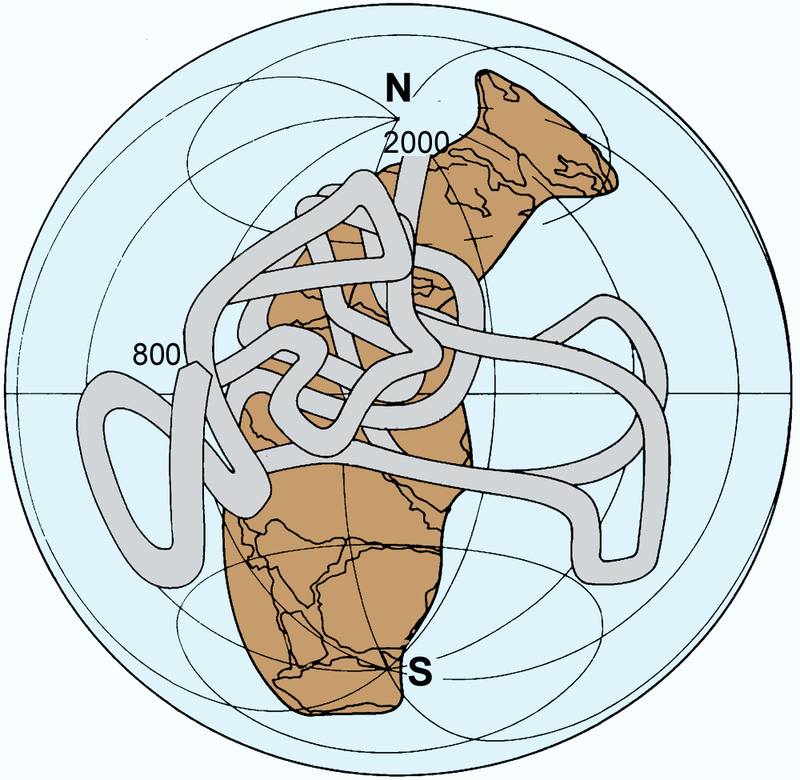 Figure 6.2 (a) The Pangaea supercontinent at 260 Ma ago, showing the lines (pink) where crustal blocks previously collided and welded together, and areas of glacial sediments (white). 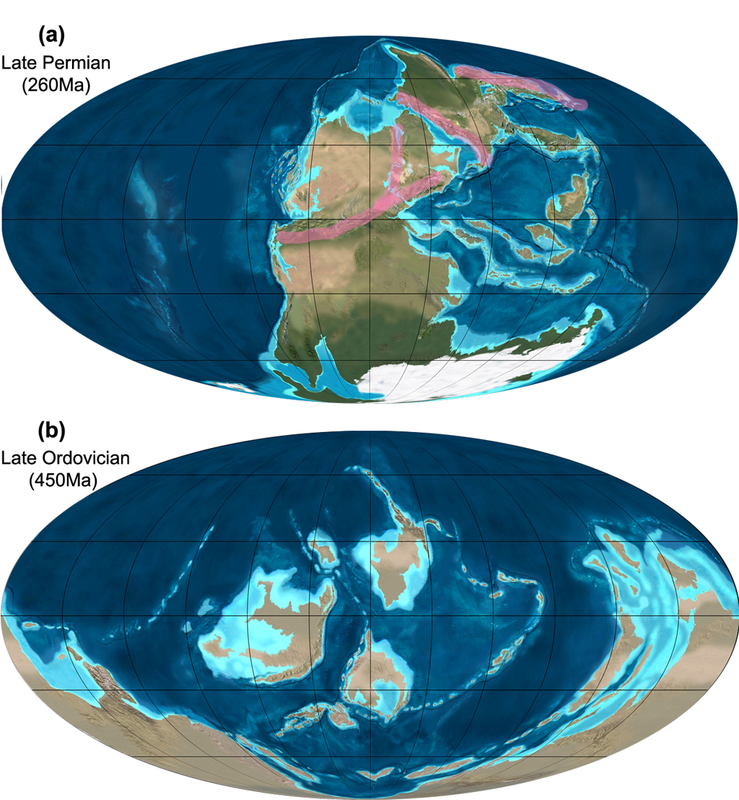 (b) Island continents of the Late Ordovician (450 Ma ago) (Mollweide projections). Based on images created by Ron Blakey. Before 350 Ma, plots of palaeomagnetic poles show that today’s southern continents, India, Africa, South America, Australia and Antarctica were clumped together in what Wegener called Gondwanaland which became part of Pangaea. However in those earlier times the remaining continental crust drifted as a series of blocks: a coherent North America; crust that now lies west of the Urals as northern Europe and Scandinavia; Siberia and Mongolia; Kazakhstan; China and several smaller fragments. Going backwards in time these blocks separate from Pangaea into independently drifting entities. About 100 Ma after life had exploded into forms with hard parts (around 542 Ma ago), its home was an ocean world with isolated island continents and the southern Gondwana supercontinent (Figure 6.2b). This approach to ancient tectonics has been beautifully illustrated by two palaeogeographers, Ron Blakey and Christopher Scotese, whose work is well worth browsing, as are a series of animations and a more advanced interactive time series using Google Earth. The 300 Ma period preceding the outbreak of fossilised life seems to have witnessed one of the greatest tectonic upheavals in the history of our world. To chart it requires leaping back to its initiation and evidence for more stable times. Magnetic poles from all continental blocks unify for the period before 800 Ma ago (Figure 6.1), suggesting another all-encompassing supercontinent. Its reconstruction relies on shuffling the blocks to line up evidence for a crustal collision event about 1100 Ma ago that affected most of them, making sure that the magnetic evidence remains coherent. The result is an almost circular supercontinent straddling the equator of the time. At its core is North America or Laurentia, around which wraps the 1100 Ma old deformed belt (Figure 6.3a). The supercontinent Rodinia (Russian for ‘mother land’) seems to have formed by accretion of lesser continental blocks to the periphery of a previously united Siberia-Laurentia-East Antarctica mass. The palaeomagnetic history following 750 Ma may have been extremely odd. In one reconstruction, the Laurentian core of Rodinia seems to have blurted outwards, leaving a huge oceanic gap into which tectonics shoved its former Rodinian companions (Figure 6.3b). The East Antarctica-Australia-India block rotated anticlockwise, eventually to unite with that comprising the clockwise-rotating ancient Amazonian, West African and Congo crust. Networks of oceanic crust that must have opened to permit this extraordinarily extroverted behaviour of Rodinia’s core were totally consumed by the readjustment. Subduction generated large volumes of new continental material in chain after chain of volcanic island arcs. Closure of the oceans squeezed these island arcs together to add to what became Gondwanaland. Because this new crustal material pervades the modern continent of Africa between older blocks, it is known collectively as the Pan African. Figure 6.3b suggests that the 200 Ma preceding the emergence of life with hard parts added perhaps 10% of new material to the continents. There are abundant magnetic records of pole position from parts of modern continents that are older than 1000 Ma. Unsurprisingly, the older those records are the more later tectonic turmoils make them difficult to recast into relative movements of crustal blocks. Geological detail from different continents clearly shows that tectonics of some kind continually generated new crust and, as we would expect from lateral movements, shoved block against block to form belts of deformation. Whether or not this was plate tectonics rests on evidence for several things: rigidity of the lithosphere; steeply-dipping subduction; metamorphic changes in rocks at very high pressure but unusually low temperatures, such as eclogites. All three parameters occurring together in crustal blocks of a similar age implis tectonics driven largely by slab-pull (Chapter 2). If they can be ruled out (not easy, as absence of evidence is not evidence of absence!) other forces driving sideways tectonics must be sought. Eclogites are known from crustal rocks in NW Russia as far back as 2.9 Ga, but opinion is divided on the beginnings of plate tectonics. Some consider it to have arisen no earlier than 1000 Ma ago, others in the mid-Archaean and a few believe it has prevailed since a lithosphere first arose on the cooling early Earth. Some compilers of palaeomagnetic data find that after adjusting for later break-ups and jostlings, poles from all continents fall on roughly the same path back to 2.0 Ga ago, which implies the existence of an older supercontinent dubbed Nuna. A previous cycle of drifting fragments of continental crust was completed by global-scale collisional events around that time. Nuna remained intact in more or less the same cluster for a long time, albeit shuffling around with tectonic activity, until it broke up to lead to Rodinia. Other geoscientists are more impressed by the ‘fuzz’ in data from such old rocks; imprecision limits detection of movements to those involving shifts of more than 15° of arc. ‘Fuzz’ of this magnitude implies that the opening and closing of oceans up to 1700 km across would defy detection; this is the reason for skeptical views of Figures 6.1 and 6.3. For times earlier than a billion years ago it is more fruitful to ask when new material emerged from mantle depths to make continents grow, rather than fruitlessly chasing the paths that they followed. Each of the modern continents contains rocks older than 2500 Ma, whose geological record goes back almost to the verge of the 4 billion year barrier, but no further. Younger rocks rim the aged rocks of this Archaean Eon. Geophysical surveys show that such ancient continental cratons underpin even larger areas than their outcrops might suggest. A characteristic of cratons is that very little has happened to them for a billion years or more, except for drifting, erosion and their partial hiding by later sediments. They are nuclei around which later tectonic events have plastered younger materials. To chart the details of their geological evolution continues to be a mammoth task, for shields are repositories for the products of every conceivable type of process. In later chapters we shall look at some of their contents for specific reasons. Later in this chapter I make a few broad generalisations regarding how Archaean tectonics might have been significantly different from that which operates today, and try to suggest when that earliest régime transformed to more familiar ways of linking mantle to surface processes. First, let’s explore how it might be possible to document the growth of continental crust as a whole. As you have seen, palpable continental material older than about 4.0 Ga eludes geologists. The magmas from which such crust forms are now generated where oceanic lithosphere subducts. These observations suggest that continental crust is a secondary product of plate tectonics. Logic implies that the continents have grown in mass over time. Verifying and amplifying that simple deduction by mapping, dating and attempting to physically measure the volumes of new crust added through time is a pretty tall order. There may even be processes that conspire to remove some continental material from the Earth’s lithosphere. Erosion, transport and the deposition of continent-derived sediments on the sea floor is one such blurring factor. Such sediments might be subducted back into the mantle. Thinly slicing material from the base of continents during subduction might also transfer some to the mantle. What is needed is a means of generalizing just how much continental material was present at the surface at any one time. There is such a method, and it is based on some important geochemical principles. The element rubidium (Rb) occurs as traces throughout the Earth’s mantle. If the mantle becomes hot enough to melt partially, then Rb enters the common basaltic magmas that make up the oceanic crust in preference to remaining in the unmelted solids. As oceanic crust is forced back into the mantle at subduction zones Rb displays another affinity. More of it enters the watery fluids that stream upwards into the overriding mantle wedge and induce it to begin melting. Such melting begins a chain of igneous processes that culminate in upward rise of slightly less dense residual magma, which forms the bulk of continental crust; granitic rock in a general sense. In each step rubidium increases in the remaining magma. Rocks making up the bulk of continents therefore have a much higher content of Rb than does the mantle. Now, a small proportion of rubidium is its unstable isotope 87Rb, which slowly decays to a stable daughter isotope of the element strontium 87Sr. That decay is the basis for one of the means of absolute dating of rocks, but it has other uses. The amount of such radiogenic 87Sr increases faster in the Rb-enriched continents than it does in either the mantle or in oceanic crust. Strontium is also a trace element in mantle rocks, and like rubidium it enter magmas in preference to remaining in the solid residues of partial melting. Consequently, the same proportions of Rb and Sr are found in basaltic rocks as in their mantle source. That relationship breaks down when silica-rich magmas evolve above subduction zones to build continental crust. Melting in the mantle wedge over subduction zones generates basaltic magma. However, in a subduction setting the basalt melt does not pass easily to the surface since the extensional conditions that typify mid-ocean ridges are not present; rather the contrary, for this is a compressional environment. The magma may pond in deep magma chambers during its rise, long delays allowing it to cool and begin crystallizing. The silicate minerals that crystallise first at high temperatures are poor in silica (SiO2), and rich in iron, magnesium and calcium. So, after this fractional crystallisation, the remaining magma is depleted in these major elements, and enriched in silica. That magma also has a lower density than its parent and its surroundings, which is able to rise to build new continental crust in higher intrusions or to erupt as lavas and fragmental or pyroclastic igneous rock. Strontium has roughly the same chemical properties as calcium, so instead of concentrating with Rb in magmas destined to build continents, a large proportion of Sr remains locked in the calcium-rich silicates of deep-crystallised magma chambers. The relative proportion of Rb to Sr in continental rocks therefore rises many times higher than that we find in basalts. The crux of this bit of simple, theoretical geochemistry is that strontium has two stable isotopes, 87Sr and 86Sr in a roughly 70:100 proportion. The 86Sr has no source other than the processes in stars that generate all the elements (Part III), and most 87Sr formed that way too. However, decay of unstable 87Rb continually adds to the amount of 87Sr. Because rubidium is everywhere, albeit in tiny quantities, with time the proportion of 87Sr relative to its lighter sister isotope becomes larger, the more Rb is around the faster this increase is. The upshot of this is that in continental materials the ratio 87Sr/86Sr increases faster than it does in either the mantle or in basalts derived from it. The 87Rb to 87Sr decay scheme is one of the simplest to use for absolute dating, so many laboratories are equipped to measure the 87Sr/86Sr ratio; it is one crucial measure needed to estimate an age by this technique. Like Mary’s little lamb, strontium obediently follows calcium, whatever happens to it, such is their chemical similarity. Depending on chemical conditions at the Earth’s surface both may dissolve in water, either through weathering of exposed continental crust, or by entering the hot water that circulates through new oceanic crust (Chapter 2). Both river water and hydrothermal fluids end up in sea water, and so do their loads of dissolved calcium and strontium, whose concentrations build up in solution. Several processes, both inorganic and those mediated by living things, are able to precipitate calcium, and therefore strontium, as solid carbonates. Limestones made up mainly of calcite therefore contain a record of the 87Sr/86Sr ratio of seawater at the time when the limestone formed. Analysing limestones laid down at different time during geological history produces a time series of 87Sr/86Sr values that reflects the varying contributions of strontium from weathered continental crust and from hydrothermal circulation through fresh ocean-floor basalt. Modern rivers carry a value of about 0.711 for the ratio, while discharges of hydrothermal fluids to the deep ocean average around 0.703. Modern ocean water and shelly creatures living in it have a 87Sr/86Sr ratio of 0.709. A simple sum shows that today’s balance of river (continental) input to hydrothermal (ocean-floor) input is in a 3:1 ratio, and that reflects the present predominance of strontium supply from the continents. Figure 6.4 Averaged time series from 3.5 Ga ago for the 87Sr/86Sr ratio in limestones (pink field) and for its estimated increase in basalts derived from the mantle (solid black line). The solid green line is an estimate of the changing volume of continental crust since 4.0 Ga, based on lead isotope data in zircons dated by the U-Pb method. Pha – Phanerozoic. 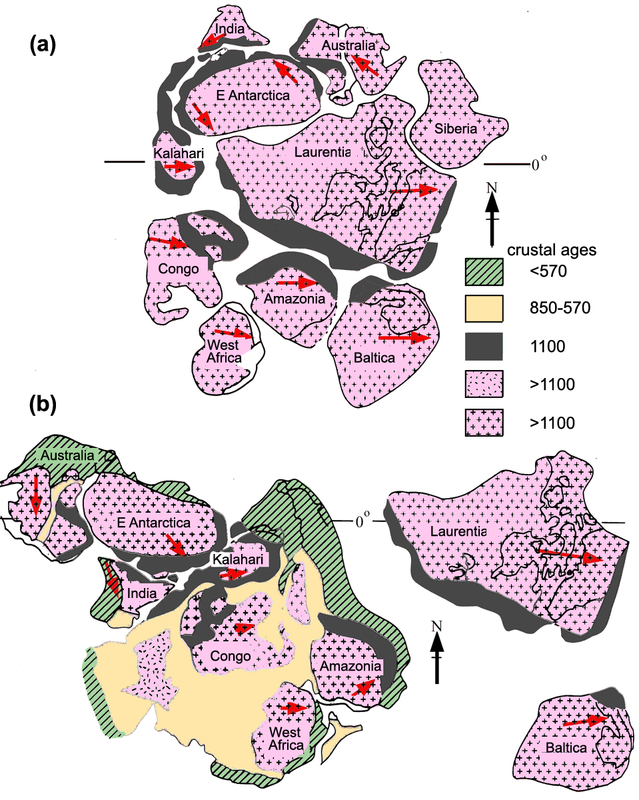 Figure 6.4 is the time series for 87Sr/86Sr in limestones since their first known occurrence about 3.5 Ga ago, together with that for basalts (an estimate of the change in the mantle). The first point to note is that there is bound to be an increasing trend in both, for decay of 87Rb continually adds 87Sr, depending on the proportion of rubidium to strontium. The mantle value has steadily risen through geological time. That in limestones began by closely following the mantle, then it increased rapidly between 2.7 to 2.5 Ga ago. From 2.5 to 0.5 Ga the limestone 87Sr/86Sr value increased slightly more rapidly than that for the mantle. In the last half-billion years it has gradually decreased. 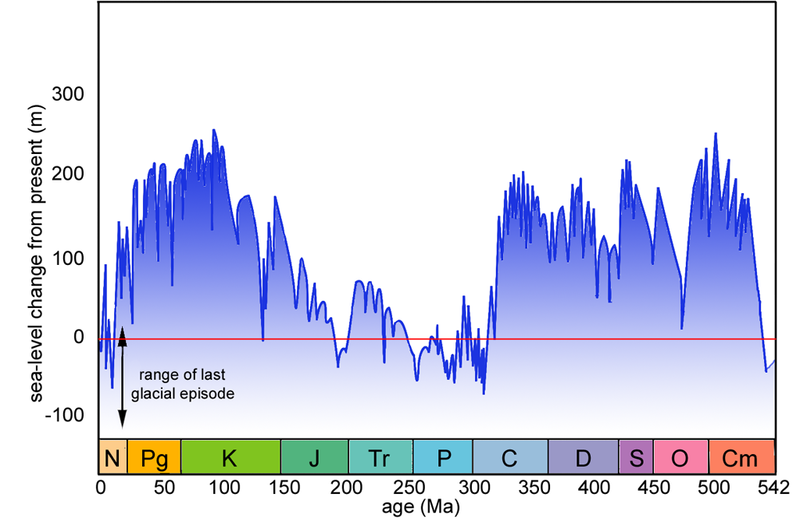 An estimate of the changing volume of continental crust based on a similar treatment of lead isotope data (green line in Fig, 6.4) follows the strontium isotope data to the end of the Archaean, including the spurt in growth in the latter part of the Eon. However, in this approach the crust apparently grew more steadily until the present. Yet both show a distinct acceleration in the growth of continental crust towards the end of the Archaean There is more to be gleaned from the details of seawater’s geochemistry during crucial periods in the history of Earth and its life, as you will see later in the book. In the rest of this chapter we must take stock of how the generalised record of continental growth matches with some theory about the evolution of whole-Earth processes. Because radioactive isotopes decay, the amount of heat generated by them decreases with time and so does the driving force for all the Earth’s internal processes, including plate tectonics. Looked at in reverse, the further back in time the more radiogenic heat there was to drive the Earth’s inner processes. Calculations show that 4 billion years ago five times more internal heat had to be lost than is produced today, and even more in the vanished half billion years of the planet’s earliest history. Undoubtedly the Archaean Earth was a far more vigorous planet than it is now. Heat loss of this magnitude is feasible in the mantle only by convection. Assuming that the dominant surface expression of this was, as it is now, outpouring of basalt magma, the extrusion of basalts must have been five times more rapid 4 billion years ago than it is now. That is a reasonable assumption, but assuming that most emerged along Archaean equivalents of oceanic ridges is not so certain. But, for the moment, let’s accept that. Increasing ocean-floor basalt output by five demands either a fivefold increase in the number of ridges and moving tectonic plates, or an equal increase in the speed at which sea-floor spreads. Either option points unerringly to oceanic lithosphere being resorbed into the mantle after one fifth the average time that the circulation takes at present. This is the key to understanding how the Archaean Earth’s outer skin may have functioned. Younger and therefore hotter lithosphere had to return to the mantle. The way that this happens today is controlled in large part by the ability of old, cold lithosphere to transform along subduction zones by drying and converting to a denser form, eclogite (Chapter 2). Not only does this pull lithosphere back into the mantle, the loss of watery fluids helps the overlying mantle wedge to partially melt, starting the chain of events that makes continental crust. Calculating the likely temperature of subducting Archaean lithosphere reveals that eclogite probably could not form then and there is no trace of such a rock before 2.9 Ga at the earliest. Instead, the damp basaltic crustal slab may well have undergone partial melting itself. That is another way in which silica-rich magmas and hence continental crust can form, but the resulting magmas would have been chemically different from those commonly encountered now. Geochemists have shown that Archaean continental rocks are different from those produced thereafter in exactly the predicted ways. Archaean continent formation was chemically different. Moreover, lacking the pull of dense eclogite, tectonics would have been odd. Plate may have slid over plate for large distances by low-angled subduction, rather than in a narrow zone above steeply decending lithosphere. Hotter lithosphere also deforms more easily, by ductile means rather than in a brittle manner. Quite possibly both thinning and thickening by extension and compression would have affected broad regions of the growing continents rather than today’s narrow rift valleys and mountain ranges. But such speculation begs a question: did plate tectonics, albeit different, dominate the Archaean scene as it does today? There is another way in which internal heat is lost, which exploits a different style of mantle convection. Today it has only a tiny expression in the rising hot plumes that fuel volcanoes of oceanic islands, such as Hawaii. In a five-times more rapidly heating Earth, might such plumes have played a greater role in shedding internal energy? The notion of ‘hot-spot tectonics’ as a major influence on Earth’s evolution is a new one, evidence for which at a smaller scale in later times came as both a big surprise to geologists, yet helped to ease a number of other thorny problems. It has an important place in Chapter 7. The oddest thing about the Archaean is that its end saw continental crust forming in a great rush. Magma formation of whatever kind needs heat and heat production declines with time. So, whatever the ins and outs of Archaean tectonics, ‘common sense’ would expect continental growth to start feverishly and gradually die down. That the opposite happened demands thinking in a different way. Perhaps the reason is that material that can form continents had always been forming, but its ability to take up permanent residence at the surface increased from about 2.7 Ga. That argument goes along the following lines. Continent-forming low-density magma may well have been produced by partial melting from basaltic crust up to about 2.7 Ga. If rocks which crystallised from that low-density magma remained attached to the residues of melting, then the average density of the whole lot remains that of basalt. United, both stand a good chance of being recycled. Continental crust in that regime is ephemeral. The gradual waning of heat production during the Archaean may provide a means of explaining the burst of continent growth at its close. Virtually every physical change in rocks takes place across narrow boundaries in another kind of space, not geographic but of the pressure-temperature variety. Either side of such boundaries processes go on with wide leeway, but once they are crossed new geological régimes take over. The basalt to eclogite change is an excellent example. Whatever the way in which silica-rich, continent-making magmas form, the chemical affinities of the heat-producing elements (uranium, thorium and potassium) demand that they enter those magmas en masse, in the same way as does rubidium. The continental crust becomes able to heat itself – and therein lies another story for it can then melt and further distill itself – but the vast bulk of this heat escapes easily by conduction to the Earth’s surface. The source of the magma, on the contrary, has lost its ability to self-heat. While ever heat flow from the deeper mantle is high enough, that source remains attached to nascent continents, and both share the same eventual fate. As deep heat production wanes a point may be reached when the residue crosses a pressure-temperature boundary that transforms it to a higher density form. The overlying continental material meanwhile is happily heating itself with its inherited radioactivity. Its former source sloughs off under gravity, not only liberating continental material but bequeathing the surface mass such a low bulk density that it becomes almost immortal. That hypothesis can account for the total lack of tangible continents older than 4 Ga, when heat production was higher still, as well as the sluggish growth of continents until about 2.7 Ga. Such delamination of continents from their source is also one explanation of why continents stand distinctly proud of the modern ocean basins. The vast bulk of post-Archaean continental crust is almost identical to that formed recently in the Andes, and the same magmas still emerge from the volcanoes there and those of island arcs. Geologists have mapped out narrow linear belts of deformation younger than 2.5 Ga, where continental masses collided after oceans slid down steep subduction zones. Few doubt that plate tectonics of the modern variety prevailed, a view supported by rare finds in the Proterozoic Eon, and even the late Archaean, of eclogites and relics of other high-pressure, low-temperature rocks thought to characterise steep subduction zones. Yet the formative progress of different continents seems not to have been steady but dominated by smaller ‘bursts’ than the end-Archaean global one. Why should the ultimate product of plate tectonics form in pulses when the internal heating is inexorably smooth and declining with time? Wider geological evidence, such as it is, places these pulses of rapid growth just after the break-up of supercontinents. These vast entities were surrounded by even mightier oceans, where oceanic lithosphere might have attained abnormal longevity and thus coolness and wetness before subducting. The new sea-floor spreading needed to drive apart the fragmenting supercontinents could create space only by destroying such aged oceans. Cool, wet oceanic lithosphere seems to be the most fertile for both subduction and driving magma formation above them. A diaspora away from supercontinents may well have triggered flurries of island arc formation, eventually to gather up their products as additions to the older continental nuclei. The fragmenting supercontinent of which most is known, Pangaea, bucks that notional trend. Continent formation has waned since it began to fragment. While heat production must maintain a steady pace, perhaps its loss from the mantle is irregular. Certainly, the best explanation for the broadest ups and downs of global sea-level over the last 500 Ma (Figure 5.5) is that ocean-floor growth fluctuates with time, and that is the main long-term transmitter of internal energy to the tectonics that drives continents around and forms the rocks within them. Yet more questions begged: where does that stored heat reside; in what form does it emerge; and when? Charting continents adrift and in collision, and the manner in which they have grown is necessarily blurred, the more so as we go back in time. Once able to take up permanent residence at the surface, they do collect mementos and they store them well. Chapter 7 rummages through this record of sediments and volcanic rocks now preserved in continental crust, to draft an evolutionary chart of both the slow interactions between crystalline crust and ‘weather’, and of extraordinary events involving both deep mantle and interplanetary space.